As I’ve already shown you in a previous blog post here, I had fun updating the XNA 3.1 Platformer game sample from Xbox 360/PC to Windows Phone 7. 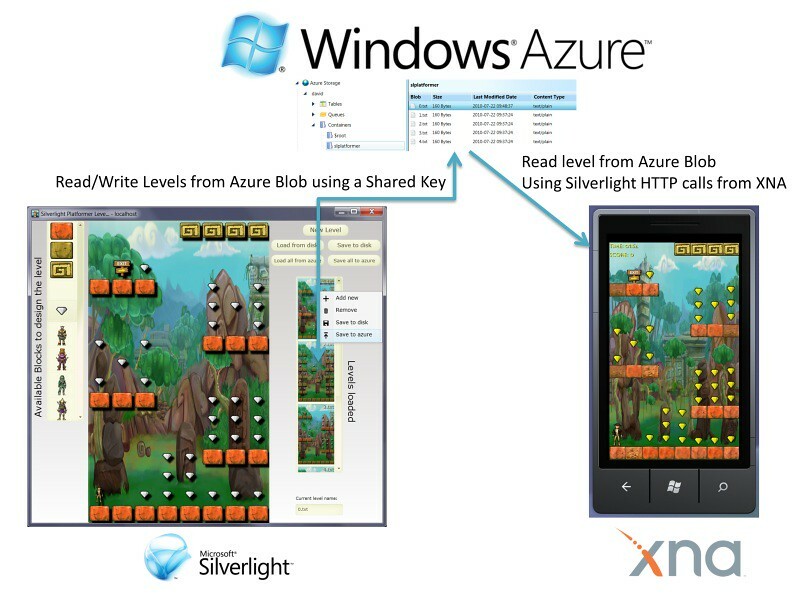 While flying back from Vegas MIX10, in the plane, my initial idea was to go further than that: creating a level editor for this little game in Silverlight 4 which will then push/store the levels in the Azure storage to let the phone reading the levels from the cloud. Thus, during my free time between 2 customers meetings or tradeshows, I’ve written the complete code to build this scenario. In fact, a kind of 2 screens and a cloud demo. This article will then overview the final solution through a diagram, a video and the Silverlight application running at the end of this page that you will be able to install out of browser. This will be the 1st post out of 4. 3 – The XNA game itself: how I’ve added some menus and how I’ve handled the HTTP communication with the Azure Blob storage. You’ll then find the two Visual Studio 2010 solutions to download in the next articles. If you’d like to learn more about the details and download the code, jump to the next article.